"Fair forms and hoary seers of ages put, and in one mighty sepulcher." "My twin, let us scan the past; let us draw aside the curtain of bygone ages, and see the record of the Book of Life, mirror of all events, sights, sounds, shapes, all things. We can do this, because we are karmaless, deathless, and are at one with the Father of Being, seeing, knowing as he knows, because He is in us." Man's course upward to God is so blind, so untaught, instinctively like the sunward turning vine. I had so confidently, in the Sagum, taken a step irrevocable, except for Mendocus; and then had fallen again into blind darkness, despair, but instinctively true to law and to Elizabeth, the object of my efforts--so upward, till at last I had gained the immortal heights. So had my alter ago, Phyris. Down below were the deserts of life, and fair appearing fruits, apples of Sodom. These ashes are good, for they cause the soul to essay the heights. Poseid, and all the lives, had meted us a large share of gall fruit, but our errors required it, and Karma is a sure paymaster. Sin begot karma and karma had exacted pay. Thus had I, for I am not relating Phyris' history, given up hopes, happiness, as one gives his open veins in the Sahara to quench the thirst of his friend. 2 By this abdication I had lost my life and found it again. Karma, as the long record showed, was not always requiring pay; for every good act I had ever done I saw that I had been fully paid in kind my every jot. These were providences and benefices of life. There is no accident in life; allow that a man may die "by accident" and no man could be sure whether the ensuing night might not find the earth dropping into, or else away from, the sun; or, seeing the sun set, could feel sure it would rise again. All things, small or great, are ordered. Not always from any pre-existent incarnation; sometimes from one's last year's or yesterday's action the fruit springs. In short, I, we, saw that the lesson of life was, "whatsoever a man soweth, that shall he also reap," cause and effect. There are those who will make cavilling argument, contend that "accident does exist, and all is not order." I argue not, for "they that have ears to hear" will understand. One cannot see over a mountain range save he stand on a taller peak. To the greater vision, accident is but an are of design, and disorder is but an arc of order. 397:1 St. Matthew v: 17-18. 397:2 St. John xv: 13. Again we looked over Atlantis, and saw many things else. The Zailm time possessed a peculiar interest. I saw that dim, distant past, a past old in the earth and ancient when Earth was yet a babe in the cradle of time. Atl, chiefest of the prehistoric races, numbering at home in Poseid, and abroad in the colonies, almost three hundred millions of souls; Atl, known through the olden earth as Atlan, Queen of the Seas," and her people as "Children of Incal," i. e., "Of the Sun," and as the "Sons of God." How are the mighty fallen! For now I behold her ancient site as part of the bed of the restless sea, covered with ocean ooze and slime, and to be known as the haunt of man only through the clear vision of the perfected eyes which scan astral records. Again the scene was presented so that we saw it as the eyes of my poor, weak, and pitifully mortal personality of Zailm had seen it. There was stately Caiphul, the Royal; and there, far away, and not so stately, Marzeus, its towers and turrets and chimneystacks and lofty buildings marking where had stood the greatest of Atlan manufacturing centers, where the machine shops and the mills had been which supplied Poseid with vailx, and naims, and all sorts of machines and instruments; with the products of the looms, the cereals and endless articles of use, and of art. Over a million artisans there by day, but by night scarce fifty thousand, all gone by car or vailx to their homes anywhere from fifty to a hundred miles away, a few minutes' ride. And all this to perish because of man's iniquity, a few short hundreds of years later. Here and there I caught glimpses of canals, distributing either natural rivers or streams, or the product of aqua-aerial generators, such as Zailm had a small model of in his last days in Umaur. And the sunshine follows he rain." There are a varying number of people always in the world; now more, now less; for as a soul comes to Earth (having been in devachan) a soul passes from Earth into devachan. But now two come while one goes, or two go while one comes, relatively. Wherefore the world is apparently encroaching upon the sources of supply, or again the supply of all things exceeds demand. But only a fixed number of Human Rays went forth from the Father, and only so many have Life, or ever will have. But these come and go as the tides ebb and flow, now on Earth, now in Heaven. Malthusians need not fear. Zailm had been my personality. But I should deal with the past, not with the future. The seeds of corruption sown in the hearts of men by the Evil One, master over Mainin, germinated and throve, and then began, some centuries after the time of Gwauxln and Zailm, a long, steadily downward course which weakened the self-respect, manhood and womanhood of Poseid, a loss revealed in countless ways, culminating in national depravity and ruin. "What wouldst thou with it?" "Naught, forsooth! I know thou wouldst throw it at yon blasphemer, if thou hadst courage!" "Courage, I lack not," was the sullen reply. A voice in the surging crowd now called out that the blasphemer of religion ought to be sacrificed on the Teo, Stone, and her heart given to the Maxin. "Listen to that! The people and the Incali would be with thee," said the wanton. "Throw the piece, and see if perchance thou mightest not reach the game." The ecclesiastic raised his hand back, and poised the missile, while the crowd nearest him gazed with eager eyes. Then the cruel bit of pottery hurtled through the air towards the fair speaker overhead. Her temple was presented, and the missile she might have avoided had she noted its coming, struck full on the dainty mark. With a cry of pain she threw up her hands, reeled, and then fell outwards, downwards, the twenty feet to the hard pavement below. The crowd, which had hushed an instant, now uttered fierce growls, and those nearest ran to the victim of the coward priest. Several of the sacerdotal caste picked the poor body up, and carrying it by the feet, arms and hair, quite as if the assault had been preconcerted, instead of being the work of one miserable fiend, started off to the Incalithlon, whose vast pyramid loomed not far away. "See!" said Phyris, "the first human sacrifice in Caiphul! Me, even me, they slew, for trying to stem the tide of depravity and ecclesiastical criminality. I repeated to them the prophecy of the Maxin, and they heeded not, but slew me. For that woman was my personality when I reincarnated, three thousand years after thou, as Zailm, did leave me, as Anzimee." With a strange ecstacy of crime, the priests, scarce an instant pausing, placed the still unconscious victim on the Teo. Then the chief priest, still called the Incalix, stepped from the Holy Seat, as it once had truly been. By the side of the victim he stopped and profaned not God, but Man, by a prayer to God; for no man can injure God except through injuring Man. Then he threw open the gray robe and bared the white breast. Swiftly he raised aloft the keen edged knife, then smote. A shudder shook the reviving victim, who was about recovering consciousness. The murderer then tore out the quivering heart and cast it into the Unfed Light, where it disappeared and made no sign. Then the flesh was divided piecemeal amongst the murderous crowd, together with the bloodstained garments. But the most of the blood had run into a depression in the Teo, made for sacrificial blood. To this the priests added liquor, and in maddened frenzy quaffed the mixture from golden goblets. The scene was sickening, and I felt my very being revolt! 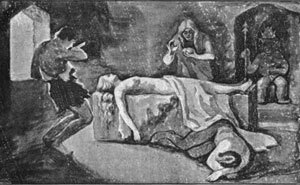 And that poor murdered woman, a virgin--who had given her life to rescue her nation from sin--that was she, who had long centuries before been Anzimee, and now was Phyris, part of myself, and I part of her being, for our Spirit was one reunited. I could forgive the crime I looked back upon, for the criminals knew not what they did. And they have suffered for it, and yet shall suffer, for it is their karma. When Death, the conqueror of all mortals, garnered his harvest in Atl, these souls, which had sown sin and grown tares. were reaped by the Great Reaper, and the tares were sown with the good wheat when next those souls reincarnated. And they have had to glean and uproot as they could, and so must continue to tear up the evil weeds till every one be uprooted. Then will they have atoned unto God. There is time enough, lives enough, but O friends, none to waste! After this human sacrifice the thirst for blood which the people manifested became unappeasable. They demanded the life of the priest who struck down the woman, for they were not yet accustomed to the rights the Incali had so newly arrogated, those of human sacrifice. They claimed that he had really murdered the woman, that they were unprepared to go so far, that therefore he who threw the missile must die. The tumult became so violent, and insurrection seemed so imminent, that the wretched priest was dragged out and offered by his fellows as the woman had been. But now came the denouement. When the high priest turned to cast the heart of the last victim into the Maxin, he staggered as if struck, his hand fell by his side, the heart dropped on the pavement, and the stricken man fell forward unconscious! The tall taper of the Unfed Light was gone; the Maxin book was gone! In its place stood a human form, that of a Son of the Solitude. In his left hand was a sword, in his right a pen. "Behold, the day of destruction is at hand which was foretold ages age! Atlan shall won be no more beheld by the sun in his whole course for the sea shall swallow you all! Attend ye!" Then the dread apparition vanished. But the Unfed Light came not again. The people fled, shrieking, leaving the priest who had fainted lying on the floor. It was as well, for when venturesome ones came into the Incalithlon many days later he still lay as he fell, for he was dead. In his greater knowledge, for wicked as he was he yet was chief, he knew, sorcerer that he was, that there really was a power of right which was destined to bring the corruption of Poseid low and uproot the hideous mockery of sin enslaving the nation. And in his knowledge his soul had gone forth from his body in desperate fear, to return no more. But the stupid sensualism of the masses, finding that after a few years nothing terrible occurred, gradually lapsed till worse than before, for human sacrifices became common, lust, gluttony and drunkenness ran riot, and the moral night's deep darkness closed in yet more blackly. "Bowed their tall heads to the plain." A crevice opened close by the vessel of refuge, and the river which, half a mile wide, had flowed past to the ocean, fifty miles away, now poured with a mighty roar into the opening. For three days this awful turmoil continued. A man came, beseeching for admittance. But Nepth said: "Nay, thou wouldst never believe in other days. I told thee then this land should sink under the seas, and thou didst revile me. Now go thy way and tell all thou dost meet that 'Nepth spake truly.'" Three days of horror, and three nights. Death stalked through the land, for the mountains fell on the plains and floods swept unrestrained. But the worst was to come. On the morning of the fourth day it seemed as if the rains of heaven would drown all, yet the thundering and turmoil was not lessened. The gates of heaven and of the great deep were yet to be broken, and the continent, yea, much also of the world to be drowned. The people not yet destroyed were myriad, and were gathered in the high places. Suddenly it seemed as if the foundations of the world were withdrawn, for by one frightful, universal motion the lands left unflooded began to sink. With never a pause to the hideous, sickening sensation, all things sank, down, down, down--one, two, a dozen feet! Then a period of rest. The rains, which came in sheets, instead of drops; the wild blasts of furious wind; the sinking motion-all ceased while men might count a score. One score, two, three, yet no resumption. The wretched people, hidden in such poor shelter as they could find and dared avail themselves of, began to breathe easier--perhaps the fearful ruin was at last stayed! But, no! A slight tremble, scarcely noticeable after the mad three days, and then with one swift leap down to death the great continent of Atlantis sank as a stone sinks in water! Not a paltry dozen feet, nor even a hundred, but almost a mile it sunk at one horrible bound! Nepth? In the middle of the third day his vessel of refuge had floated to the ocean on an outgoing rush of the floods, and there the winds had carried him until, when Atl sped down to death, he and his storm-beaten ark were a couple of hundred miles away. A very few other people had been similarly forced seawards, and these, after weary weeks, at last came around the southern promontory of Africa, and drifted northeasterly, to land on the west coast of Umaur. Here, too, the destruction had left but a few miserable survivors. But the few hundreds thus left founded the race which, repopulating that land, was found by Pizarro after many centuries upon centuries had elapsed. And a few thus became many. They would not permit blood sacrifice, but yet, like Nepth, offered fruits to Incal, and retained the name, slightly modified, so as to be Inca, a name bestowed upon their rulers. A few survivors landed further north, and repopulated the land conquered by Cortez, the Spaniard, a few short centuries ago. But these heeded not the lesson, for no sooner were they landed on the desolated shores than they slew a woman as a thanksgiving for their escape. But Nepth? For many days his vessel drifted over the silent seas, with only the ceaseless roar of rain upon the roof to break the stillness. At last the vessel grounded. He knew not where he was, for he was an ignorant man. But the aspect of things was changed wholly. When at last he descended, and let loose his living freight, though he knew it not, he was in Asia. This land had not suffered as other lands, but yet floods had covered all the western part of Asia. The eastern portions, and what there was of Europe and America, had not remained inundated after the quick subsidence of the enormous tidal-wave, which, thirteen hundred feet in height, swept outward from Atlantis' site upon the recoil of the engulfing ocean. Thus closed the scene for us; the great deluge was over. Then Phyris and I turned to other phases of the mysterious, past. These, though not less interesting, may not enter these pages. Rai Gwauxln was come to be Mendocus, while Rai Ernon of Suern was with us now, Mol Lang. Sohma was that, Son of the Solitude whom I took on my vailx when I was Zailm, away from Suern. So we saw the interweaving of the life lines. Then we saw the course of the lost soul, Mainin, from remote ages when Atlantis was not known in the earth, a sin-laden man then, until we found him, serving Satan, an outcast from human ranks, blasted thence by that Son of God, "first fruit of them that (had reincarnated) slept." Looking, we saw that early Rai of Poseid, him of the Maxin Stone and the Unfed Light, the Lawgiver. We knew him for the Christ, illumining man then, and later as Buddha, and again overshining that greater than Buddha, the Nazarene. "Before Abraham was, I am." Whosoever the Christ-Spirit entereth into and abideth in, becometh a Son of God, and equal with Gautama; but into no one will it enter who doth not travel the Path. That mighty One blasted Mainin. Yet we saw that because Mainin had crossed our life then, I was thereby made the instrument of mercy to him by Christ, and that occasion was yet to come. Back of the time of Zailm we gazed upon a scene on the great continent of Lemuria, or Lemorus. We saw a great house built of stone, standing on a grassy sward, a plain, over which roamed herds of cattle, and queer little horses, having three toes to each foot and high shoulders. Far to the east was a blue mountain range, beyond that a great ocean. But between the manse and mountains flashed a silvery lake. Within the house were many people, servitors all to two people, a woman and her son. Gloom overspread all faces, the gloom of blood. To a chief among subordinates the son gave orders. This slave, grim, ferocious, a very incarnation of cruelty, attracted my notice. His brown skin was swarthy, his hands talon-like. Only a breech-cloth apparelled him. Receiving his orders, he disappeared, but soon came again, pushing two manacled people, plainly of a different race from any there. One was a youth, lithe, erect, rather haughty of mien, his hair brown, his features symmetrical; that individuality of twenty-three thousand years ago is now Sohma. The other captive was a fair girl, sister to the youth, it seemed. Her beauty was delicate, but voluptuous. The fierce, cruel eyes, gleaming like live coals from under the shaggy brows of the master of the house, lighted with admiration as he saw the girl. His heavy-set figure, his coarse jaw, thick neck, and round, shaven head, all fitted him to be master of the brutish crowd around him. This man extended his hand as if to touch the captive maiden. She shrank away, and drew her figure erect in a queenly scorn. "Ha! Unyielding as ever!" quoth the master. "We shall see." He nodded to the chief slave, who threw the captive boy on a sort of altar beside him. He bound him. But the victim said firmly: "Sister, yield not; die first." Her eyes shone with an awful light of horror. "Stop his voice," exclaimed the master; and the slave, nothing loath, cut out the poor boy's tongue! "Beast!" hissed the girl to the master. "The gods say that the girl also must die." "Say they so? By all the powers I will not obey," shouted the master. "Not though my troops of war fail, and the King fails!" "My son," said the priestess, "thou mayest not avoid this sacrifice and live, say the gods." "No? Then the gods be served. Give me that knife." He felt its keen edge, and then asked, without taking his eyes from the weapon, "Say the gods yet so?" "Even yet," said the priestess. "Accept, ye gods, this sacrifice." An instant the knife glittered overhead, the next he had buried it in his own heart. So had the heart that knew no mercy yielded to love; the stern warrior was dead. The gods must have blood, he thought, but he gave his own. What personality was he, was the girl, dead from horror? Myself! and Phyris! 400:1 II. Peter iii: 10. CHAPTER V. "MAN'S INHUMANITY TO MAN"
Again the dead past revealed another scene. I saw myself in the person of an ill-fed, ill-treated slave, ever hungry, wretched, too much so to feel resentment. I died hungry, and then had a devachan of seeming realization of my wants. 'Then again rebirth, and through a karma not here to be explained, the new man had ease, wealth, plenty. But a physical karma pursued, and he was ever hungry in the midst of plentitude, and lazy when action was necessary. This state begot disease, and the product of (in his previous life) "man's inhumanity to man," was afflicted with cancer of the stomach. This killed the ferocious appetite, and the sybarite, free of this, set to work to cure himself. Finding he must fail, he sought comfort in religion, and went forth to the wilderness to become a religious hermit. Now, a hermit's life is one of uselessness to mankind. In that lone state my individuality lost opportunities to cultivate moral strength by worldly contact, and behold me after death come again to life as Zailm, weak enough to sin with Lolix and beget then a karma that lasted, with newly got vigor, till only a few years ago, punishing me more bitterly than death, as thou, knowest. If Zailm, had sorrow, thou knowest he had also joy. So every life-karma is made up of sunshine and shadow. "A tooth for a tooth?" Yea! But also "for a kiss a kiss." Looking along the line of life's yesterdays the reason became apparent why all the wondrous attainments of Poseid had ceased and left no sign, why Atla, which metaphorically held aloft the world into the light of science, had sunk beneath the waters and gone down into deep, mysterious caverns, to be hidden in an ignorance greater than that which shadowed Pompeii and Herculaneum from subsequent centuries. Natural decadence tells the story. As the centuries succeeding the time of the great Rai Gwauxln lapsed, ten, fifteen, twenty and more, the nation came to a greater glory of mechanics, of science, and of Physical condition than even Gwauxln's time had known. One by one the scholars found that those things which had always been possible only through mechanical contrivance were more easily accomplished by purely psychic means; they learned it was possible to divest themselves of the flesh, and in astral body go whither they would and appear, instant as the electric current, at any distance. They learned that they could perform material actions when they had thus projected themselves. Then it was that the cruder methods, vailx and naim, and all else similar, were suffered to lapse into that semi-forgetfulness of the Suerni; and exactly as they, so the mass of Poseidi depended on the priesthood for all these things. For only the few exalted minds could thus reach out into the deeper night-side of Nature; the many must remain in the lesser places. Inevitably then came corruption of power; the few were masters, and the many had no recourse, because the master of psychics is invulnerable to the laws of physicality when wielded by men less than he. Then, indeed, was the day come when ripeness was on the land and on the people. The ripe pear can not keep perfect, but at the heart begins a decay that spreads from core to cortex, and lo, the end. So in Poseid, at the core began the outward-spreading rot. That core was the education of the people. Whenever earth's nations shall cease to educate the coming generation, decay shall begin for the people. In Poseid the few had attained such exalted knowledge of natural forces that the many could not hope to overtake them. Then, discontented with the comparatively poor education themselves had, they suffered all its marvels to wane. Thus, ere thirty centuries after Gwauxln the Poseid race was as Suern, but more corrupt, and lust, appetite, passion and power had laid fatal grasp on the proudest people the earth has ever known. How little dost thou realize when thou readest in Hebrew Scriptures of the destruction of the cities of the Plain it is the account, of the doom of Marzeus and Terna, destroyed by the Navaz forces they had forgotten how to control That destruction heralded that of the continent, nine centuries later. A, ye! Poseid arose to an altitude which the wildest dreams of science have not predicted for the modern world; arose, flourished and decayed, in the fullness of cyclic times. And America is Poseid come again, reincarnated, and shall see its scientific people repeat, but on a higher plane, the attainments of Atla. As the centuries pass it shall see the successive enfleshment of those souls which in Atla, made that land proud, prouder, proudest. But it shall do more, for America hath developed that soul-element which, when her people were Poseidi, was first faintly traced. So, though repeating, it shall do more--it shall have all Atla's marvels wedded to the glorious soul foreseen for mankind by Him of Nazareth. It shall flourish so, and then, in the fullness of its time, decay. But that shall not be for four and a half centurial decades. I might give many more life scenes. Let these suffice. Turn now to our present. The reunion of the semi-egoii is one in which, after the mighty ordeal of the Great Crisis, the souls of the feminine and masculine elements become on the same plane; both are perfect. This is the marriage made in heaven. Become so that each thinks, wills and expresses itself the same in all ways simultaneously, the two alter egoii are then one, having a feminine, negative, and a masculine, positive, aspect. Then these two potentials unite and receive the Spirit, or I AM, which was always undivided, and which illumined each soul of its pair equally. So is this last union. Thus Phyris is me, living, being, immanent, and speaks this message with me; is I, and yet, mysterious truth, is herself! Likewise I am her and yet again, myself. I speak, and it is she; she speaks and it is I; for we are one being, one spirit, androgyne, perfect. Yet not perfect as our Father is, for He is perfect as Conditionless Being, but our perfection is that of a part, because we are all of God, but not He of any one of us. Indeed, were this not true, then our attainment of perfection, Jesus' attainment of it, or any child of the Father, would find in its realization annihilation. But only the soul that sins is cast into the second death, fated to the Sisyphic round till it does succeed. Perfection may be conditionless in all respects save that it is not that of the whole. And because we each axe parts, therefore are we forever attracted to the Father, who is sum of all parts, and this attraction is to onward Being. And we are ever attracted to the other parts, both those which are peer and those which are less. It is because the part is forever drawn to the sum that there is no death, save in defying and abandoning all hold on the Whole. Perfection of a part but draws it nearer to the Whole, and perfection of the Whole compels It to depend on each of Its parts. There may be change; there is no death. And there may be extinction of personality, the erring soul may perish, and itself and deeds he annihilated, but the Spirit from the Father dieth not. If for thy soul thou wouldst have eternal life; if thou wouldst not see thy soul, that product of untold ages of time, lost in the second Death, and thyself, oh Spirit, child of our Father, doomed to recreate another soul to lay as acceptable offering before our Lord, then subdue it, subdue thy soul, at--one it to God through Jesus Christ our Lord, by recognizing that it is His, given Him by God, made by thee to serve the Creator. If thou make thy soul serve thee in His service, thou hast it eternally. But if thou serve it thou shalt lose it and have to make another during coming aeons. Wilt thou follow the Path. even as I have pointed out to thee that it leadeth to the Kingdom? Be sure of thyself ere thou dost embrace occult learning, lest it prove a veritable Bridge of Mirzah, full of fatal pitfalls for thy feet. Better shun the Secret Wisdom than fail, for strait is the gate and narrow is the way that leadeth unto Being, and few there be that find it. Knowest thou me? A good tree cannot bring forth evil fruit, but a corrupt tree. Wilt thou hew me down and cast me into the fire, who testifieth concerning the Spirit? "Not every one that sayeth Lord, Lord, shall enter into Heaven," but he that doeth the will of my Father in Heaven. The time is brief. I have spoken. Peace be with thee.